At Last year’s CES event, popular gaming company Razer announced a crazy concept laptop that has three screens. 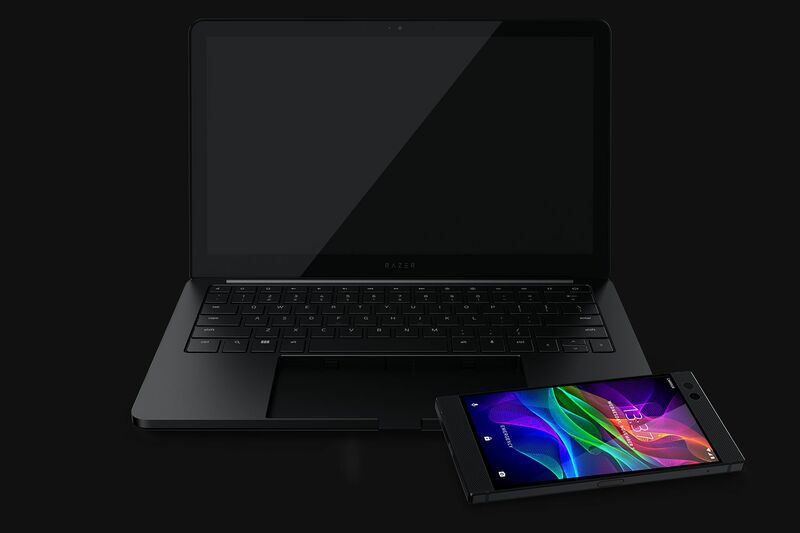 Now they’re back with a new concept called Linda, which is a laptop dock for their Razer Phone. Instead of past laptop docks, the phone would dock into a cavity where the trackpad would normally go, replacing the need for one entirely. When users put the phone in the cavity and push a button on the keyboard, the USB-C connector comes out and makes a solid connection with the phone. There is also a notch in the tray to give easy access to the side-mounted fingerprint sensor, and an easy way to remove the phone once the USB-C connector is removed. According to marketing manager Kevin Sather, the two devices weren’t “fully” designed in parallel, but the overall design is seamless and looks well put together. Some might even mistake it for the company’s other Blade laptops. Speaking of which, Project Linda is just a tad bit thicker than those, by just .05 inches, to better accommodate the design of the phone. When docked, you can use the Razer phone as a mirror to Project Linda’s 13.3-inch Quad HD display, or as a second screen for certain games and apps. There is a pair of USB ports on the laptop, one full size and one USB-C for gaming accessories. Alongside is the I/O connections is a 720p webcam, a dual-array mic, and a 3.5mm audio jack. Powering the laptop is a 53.6Wh battery, which can recharge the Razer phone completely three times. There is also 200GB of additional storage on the laptop dock itself. Speakers come from the Razer Phone itself, making the whole device weigh just 2.75 pounds once the phone is docked. Razer is still making the point that Project Linda is currently a concept, and they are working on ways to improve the device even further. Razer is looking at making the laptops screen the same as what’s found on the phone, so the display could pack a 120Hz Quad HD touchscreen that is HDR capable, which is not on the market as of now. In the meantime, Razer is more than happy to gather feedback from everyone, and use it to form the basis of the final design, whenever it comes to market. What do you think of Project Linda? Let us know in the comments down below, or on any of our social media pages. CES 2018 is still underway, so stay tuned to TechDependent for more of our coverage. To get caught up in everything that has happened so far, click here.